Infrequent piratical ramblings of the Captain of these here waters on all sorts of topics of a hobby nature. Learn the secrets of miniature sculpting from a Professional Miniature Sculptor with over 20 years experience in the tabletop gaming industry! Courses are for all levels of experience from beginner to advanced and cover everything from conversions and basing, to textures and gear, to anatomy and much more! The web place for news and information about the hobby. 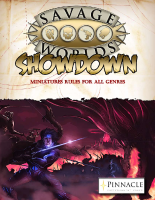 A free PDF skirmish rule set based on the Savage Worlds system. Brought to you by the fine folks at Pinnacle Entertainment Group.